Over 60% of visits (sessions) are from a mobile device, according to recent data released by TradeMe. Mobile sessions overtook desktop usage for the first time in 2014 which signals an even greater need for adaptive, responsive and targeted website design. 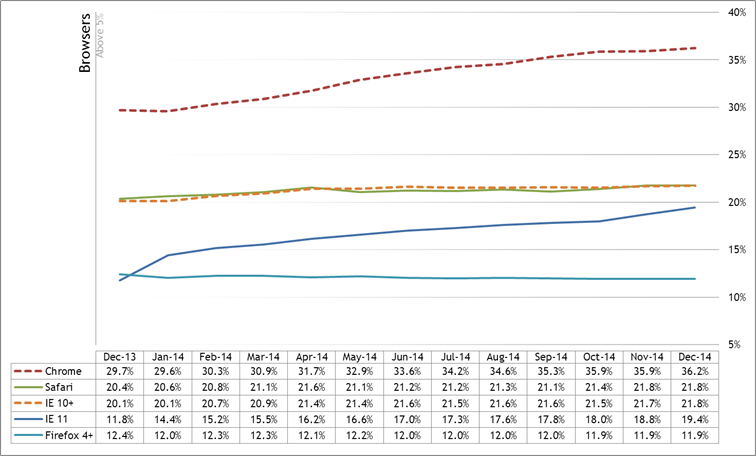 For desktop users, Google Chrome usage continues to increase. Over the last twelve months, usage increased from 29.7% to 36.2%, mostly at the expense of Internet Explorer which dropped from 31.5% to 26.9% whilst Apple’s Safari increased marginally by 1.4 percentage points to 21.8%. Internet Explorer’s legacy browsers (IE7-8)* are on a significant decline and has more than halved over the year accounting for less than 2.6% of usage compared to 6.8% in January. It’s not all bad news for Internet Explorer, however, as users of IE10 and above has increased to 21.8%, from 20.1%. This is also good news for modern web standards and gives businesses more flexibility and cost-saving opportunities. Mobile usage has increased at TradeMe and data shows that mobile users visit more regularly, accounting for mobile usage of nearly two-thirds. For unique users, 21.5% use a mobile device. Unfortunately, this figure doesn’t tell us how many also use a desktop site. The majority were Apple iPad / iPhone users representing around 75% of this figure. That’s not the full picture, however. TradeMe also have another domain used for touch based mobile devices where exact figures don’t seem to be included. 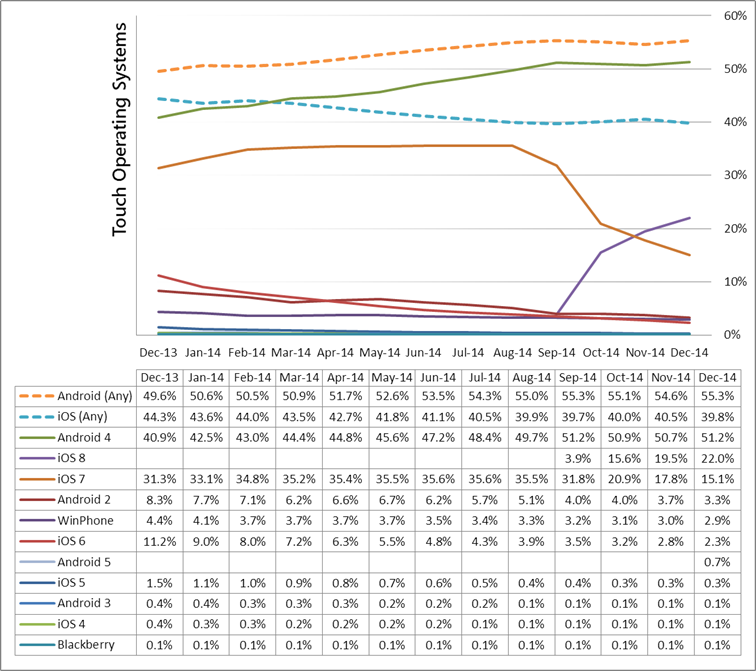 Those figures show Android usage of 55.3% compared with Apple’s 29.8% and Windows Phone hovering around 3%. For more details, you can see the complete details at TradeMe Labs. So, that rounds up 2014 according to one of New Zealand’s most successful internet companies. What does mobile usage mean for New Zealand’s small business websites? These figures indicate that it has never been more important to have a mobile website and an adaptive / responsive design to cater for users on both desktop and mobile browsers. More details are here.